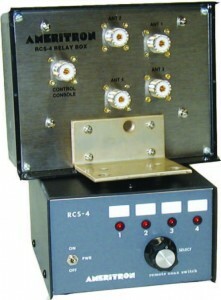 This is a a review of Ameritron’s RCS-4 Coax Switch, covering its use and mounting. I purchased the RCS-4 several years ago from HRO thinking I would get it outside sometime soon, that didn’t happen. Two years later it was it was still installed inside the shack, on my feedline, switching between a dummy load, and my feedline run outside. I recently, decided to add a 4-Square for 30 meters, completely redo my antenna feed system, and replaced my trusty 756 PRO III, with a new Elecraft K3! This seemed like a good time to really just redo everything in the back yard, and the shack, moving the RCS-4 outside as well. My GAP Challenger was giving me a bit of trouble anyway, and it was time to rebuild it as it had not been looked at, or touched in a any way, for maybe 10 years or more. The feedline was getting water in it, and the phasing harness needed replacement, and the three radials needed to be redone from scratch. See the article titled “Phased Arrays for 40 and 30 Meters” if you are interested in what was done to accomplish all of this. The long and the short of this is that I ended up with two antenna and I needed a remote switch for them, as well as some capability for future expansion of antenna. Antenna 4 is a GAP Challenger, and antenna 3 is a MonoGAP, for 30 Meters. The antenna selection process for which antenna ends up in which feed point is important. When there is no power feed to the RCS-4, antenna 4 is selected as the power off default, so you should put your 80-10 antenna there. I remembered my RCS-4, sitting on the floor for the past two years, and decided to move it outdoors. Given I don’t have a tower, but I had an outdoor building, I elected to mount the switch on the side of the building, giving me the ability to run the feedline to the building in the event I wanted to add tuners, or anything else that needed to be in a covered environment. The included U-bolt mounting hardware made this a simple task, I drilled two holes in the wall of the outbuilding the width of the U-Bolt, straddling a stud in the wall, and fed it through the holes and into the RCS-4. So mounting was not going to be an issue. That did however leave a small set of holes that water, or insects could enter the outbuilding through, so I got out the trusty twenty five year silicon putty, and went to work on them. After puttying up the holes, it occurred to me that the RCS-4 plastic shield might catch water and move it to the entry holes, so I added a bit more silicon wherever the plastic housing touched the building to guide water away from the entry holes. It turns out that the rain almost never touches the RCS-4 cover because of very wide eves on the out building. I had already run the four inch tunneling all over the back yard, and sunk six concrete mounting positions for each antenna, so all I really had to do was to pull coax from the now wall mounted RCS-4 to the antenna mount points via the tunneling. If you look closley at the photo on the left, you can see the RCS-4 and cables on the wall facing the camera. I dressed and ran the new feedline from the shack down the tunnel to the antenna, and ran the feedline up to the RCS-4. That put all water contacting the coax switch running down the coax, away from the RCS-4, effectively producing drip loops for all feedlines away from the RCS-4, and moving all water away from the tunneling entry points. So after connecting everything together I had my twin antenna, and a switch to go between them. I have had zero trouble with the RCS-4, over the past few months, and it seems to be holding up well to the wet Oregon weather. I tested for, and noticed no increase in SWR on anything below 20 Meters. I did not test higher than that. Power requirements: 120 VAC 50/60 Hz at 5 Watts. As far as I can tell, the device meets these specs. I have put 1.5 KW RTTY through the device over the past few few years, I could feel some warmth on the top of the plastic cover, but it has seemed to hold up OK. About two weeks after mounting the box outside, I had an “RF Event”. As a result of the “RF Event”, the tuner I was using, an LDG-AT1000 PRO II, went up in flames while running RTTY. I pulled the tuner and replaced it with a jumper, and nothing… SWR was infinity to 1. Looking outside I could see that something had happened to one of the connectors connected to the RCS-4. I had a coax jumper I purchased several years ago go south on me, downstream of the RCS-4 switch box, on the antenna side of things. I was not sure what happened then, but I knew I had located a major problem as the end of the coax was pretty well burned up. Upon inspection later I think I can piece together what happened. As I was rebuilding my outside setup, I had reused a coax jumper which was already in place, this jumper had been in place for years! This jumper had also been purchased at a local ham fair by a well known cable vendor, and it used crimp on connectors. Now, step back a few years in time, to the weeks after I bought a few of these jumpers from the vendor… I take them home, and put them in place… After a few weeks I notice all sorts of issues with SWR. So I look at the cables, and sure enough the center guide pin is loose on about 75% of them. On a few I can just pull the center pin up off of the center conductor of the Coax cable– with nothing more than my fingers. The vendor is gone, the Ham Fest is over, so the cables go in the trash. I elect to NEVER use crimp on connectors again, and vow that from now on I build my own cable when I need them. Fast forward to today. I find a burned end, on a jumper. Looking at the jumper I can see it is an old crimp on. My fault for not removing ALL of the crimp on jumpers. Evidently I had used one outside, and forgotten to remove it. Now all suspicion of failure focused on the coax cable jumper I used. Yes, it was an older crimp on from the same batch I had purchased from a vendor at a local ham fest. I looked at the remaining unburned end, and found that the center guide pin could be pulled off the center conductor of the coax cable by hand, just like the rest of them. That got me to thinking… I started looking around the area I had been working in, and sure enough I found an “extra” center guide laying on the dirt below the area where I was working. That explained what had happened… During the rebuild of the feedline, I had unscrewed one end of the poorly constructed jumper cable, leaving the other end in place, and just screwed it into the antenna 4 position of the RCS-4. The center guide had fallen out while doing this, and was now on the ground for me to find later. Here is what I suspect happened– the center conductor was stranded wire, the center guide pin fell off during the switch of the feedline to the RCS-4. One or more strands of wire from the coax center conductor got across ground finally, and when I dropped into transmit the coax end presented a direct short to the RCS-4, and the LDG tuner, at 1.5 KW. This pretty well fried the RCS-4, and the LDG tuner all but exploded, as it sat in front of me at the operating position. It actually made a screaming sound as the air rushed in to support the ensuing fire inside the box. I replaced the jumper with one I made for the job, ordered a new RCS-4, LDG tuner, and replaced the RCS-4 with a double female connector. Once the replacement RCS-4 arrived, I installed it and all was well… So overall the RCS-4 failed to take a direct short at the 1.5 KW level… Not bad really! I think I could rebuild it, and probably will. It is outside airing out now… On the other hand, the LDG took most of the brunt of the power, so it is beyond repair. It is not parts for my current PRO II autotuner. When the RCS-4 arrived I had already built a DC power cable to connect to my station DC supply. I got everything connected back up and attempted to change antenna… Only two positions worked… Off, and I believe Antenna 1. Note this is a new RCS-4, right out of the box… After some puzzeling, I finally decided to get out the diagram, and as I looked at the schematic I noticed that the unit takes AC, not DC for power… Why? So they can get 4 different switch states… Off, AC, DC-normal, and DC-reversed. So I connected the supplied AC wall wart, and all worked as expected… That took about two hours to solve though. 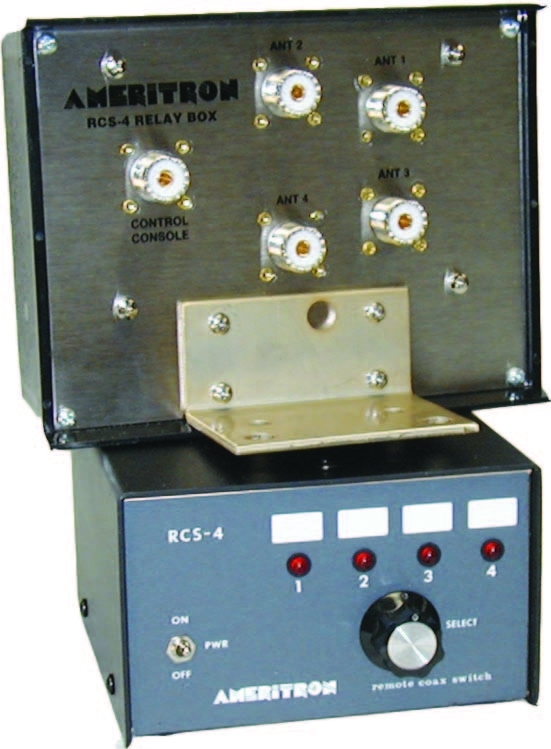 I have had zero issues with the RCS-4 over the years that I have had it, and it has preformed flawlessly, even with a 3 or 4 to 1 SWR running RTTY at 500 W. I have and do run 1.5 KW RTTY into the GAP Challenger, on 40 and the switch takes it well. Also, I noted no insertion loss, but I did not measure, just by ear. I would, (and have), bought a second RCS-4. It would be nice if it did more than 4 antenna, but it can’t with no control line… That is one of the really good points about this device, it needs no control cable of any kind, it runs power up the coax, and both controls, and runs the switch relays. All in all, I like it, and am very happy with it.